Glass of Fancy » Blog Archive » Holiday Treats! 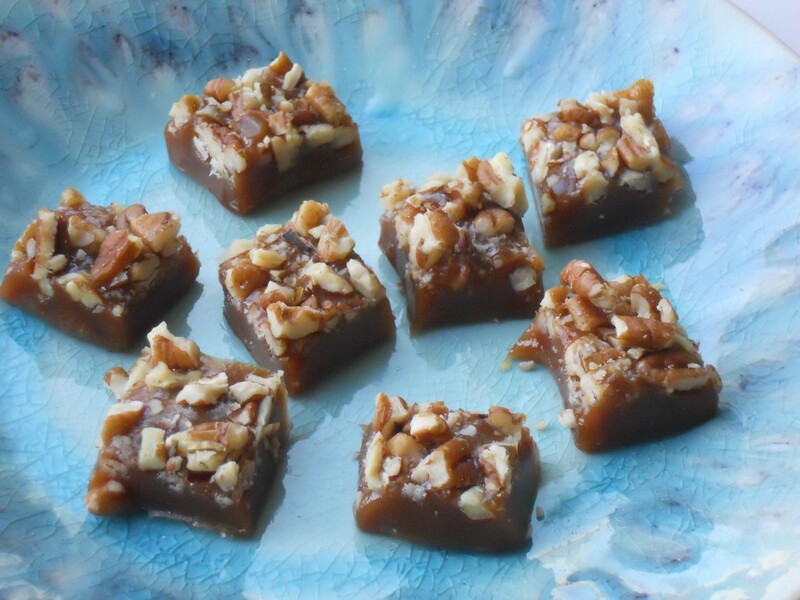 Pecan Caramels - Fashion, fiction, and life in the city. Line an 8” x 8” pan with parchment paper and lightly oil the paper. (You will be glad for this later). Boil sugar, corn syrup, and water in a large heavy saucepan, stirring until sugar is dissolved. Boil, without stirring but gently swirling pan, until mixture is a light golden caramel color. Carefully stir in the cream (it will boil up significantly, so pour cautiously). Clip on a candy thermometer and simmer, stirring frequently, until the temperature reaches 248 F, 10 to 15 minutes. Turn into the prepared pan and scatter evenly with pecans. Let the caramel cool thoroughly, then lift it out of the pan onto a cutting board and cut into one-inch squares using an oiled knife. If necessary, give the pecans a gentle press into the caramel to help them adhere. For cutting a softer caramel, chilling the batch in the refrigerator first will be helpful, but if you’ve made a firmer caramel letting it come closer to room temperature will make it more manageable. Wrap in cellophane or wax paper squares (you can get them online or at candy supply stores). They’ll keep for a few weeks… assuming you can keep from eating them for that long. Peppermint Candy Tray at A Cook and Her Books. Ottolenghi-Style Eggplant with Tahini and Pomegranate at Spicebox Travels. Bibingka (Mini Filipino Rice Cakes in Banana Leaves) at Asian in America. Spiced Shortbread Cookies at HapaMama. Ornament Sandwiches at Sandwich Surprise. Toblerone and Roasted Almond Tree at Monday Morning Cooking Club. Merry Kale Trees at Free Range Cookies. Lemongrass and Pandan Christmas Sugar Cookies at The Asian Grandmother’s Cookbook. Gingerbread Snowflake Cookies at Vivian Pei. Buche de Noel at Nancie McDermott. Chewy Gingerbread Cookies at Insatiable Munchies. This entry was posted on Friday, December 13th, 2013 at 2:50 pm	and is filed under Manna. You can follow any responses to this entry through the RSS 2.0 feed. You can leave a response, or trackback from your own site. Those look so good. Happy holidays! I’ve made caramel icing and caramel sauce and creme caramel, and I have the excellent thermometer. But I have never made caramels. The Not Leaving the STOVE part is my challenge, that and abject fear of Messing Up, Not Getting It Right. You make it sound like something I can do. Going to do it! With pecans. Thank you. You can totally do it! I encourage use of the cold water method as a backup just to be sure you’re getting it where you want it.